Having grown up without any real-world exposure to the military or military culture, moving to San Diego has an been an almost daily education for me about our nation and its armed forces, and one I’ve enjoyed immensely. I still get school-boy giddy when I drive the 5 through Camp Pendleton and the Marines are in the middle of exercises – the more tanks, the better – and I’m only too happy to let veterans tell me stories from their days of service. That said, I was greatly looking forward to finally touring the USS Midway, the legendary battleship moored in San Diego harbor. That day finally came on Friday, and I was simply awed by everything I saw, heard (they simulate sounds of the ship deployed at sea) and learned during two hours aboard the massive ship. 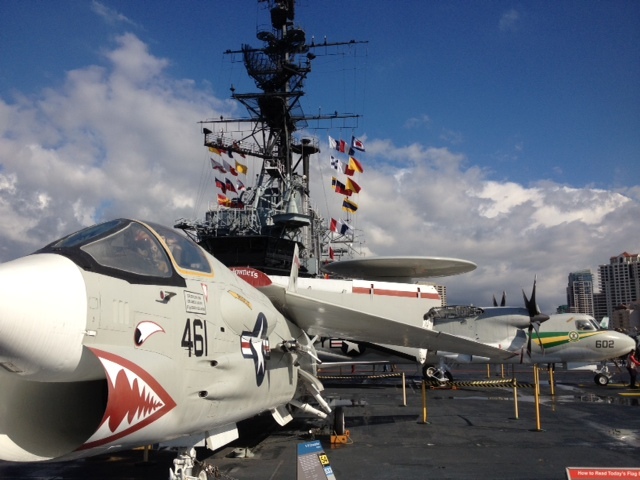 I will say upfront that two hours is an inadequate amount to devote to touring the Midway, so what you’re about to read is more impressions about the tour than a definitive guide. Just getting through the ship , which spans 18 decks and 1,000 feet, is a workout unto itself, much less trying to take in all the educational accents – speakers, flight simulators, artifacts, signage, etc. – that make this such an exquisite education about the Midway, our military, our country and our history. And you’re doing all this while climbing what amounts to a giant floating jungle gym. You’re always stepping over something, climbing up or down something, or ducking under something while you’re navigating the Midway. That’s just one of many ways in which you get a sense of what life was like on the Midway for the men who were deployed on it for up to six months at a time. The tour itself is heavy on education about what a military lifestyle was like aboard the ship, but it ends with what for me was a surprising and unexpected look at what it really was like during combat. 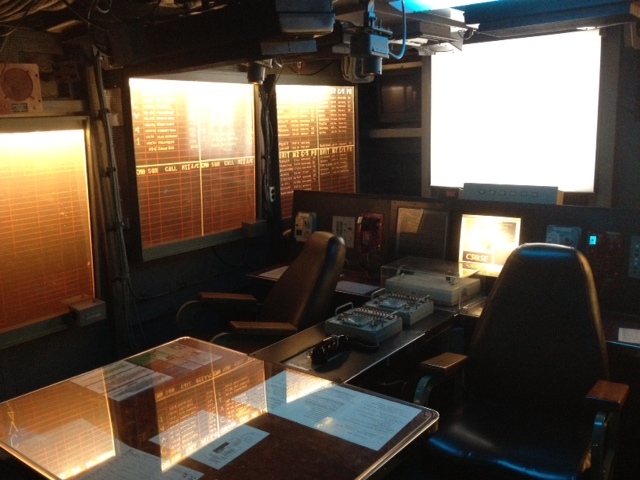 The war room is set up circa the Persian Gulf War, with war plans and targeting equipment still locked on Iraq. It’s a giant dose of modern history that is made very real by the veterans staffing the ship. But before we throw down on Iraq again, let’s look briefly at the history of the Midway and take a minute to appreciate one of the true marvels of our military. Anytime you tour something as massive and complex as the Midway, you can expect to be hit with a veritable avalanche of mind-boggling facts and stats. The Midway doesn’t disappoint in that regard, but lets at least cover the basics. The Midway was launched in 1945 and saw action in Vietnam and the Persian Gulf and basically toured the world, including the Arctic, until it was decommissioned in 1992. It now serves as a military museum for a million tourists annually. The ship weighs 69,000 tons (20 ton in just anchors), is 1,001 feet long, has a four-acre flight deck, consists of 2,000 compartments spread over 18 decks and was home to a crew of 4,500. It was reportedly the first ship to be too big to fit through the Panama Canal. The program and tour delivers as many of these facts as you could ever want, but to channel my pastor, the master of simplification, let’s just say this: it’s a really big ship. The enormity of the Midway, of course, is what first strikes you, before you ever board the ship, but your world gets very small very quickly once you enter the vessel. This is not a tour for claustrophobics. One of your first stops is the cramped sleeping quarters for the crew, and as your progress through the ship, you realize there’s a direct ratio between rank and sleeping space and even proximity of your bed to light. In other words, it’s good to be an admiral. 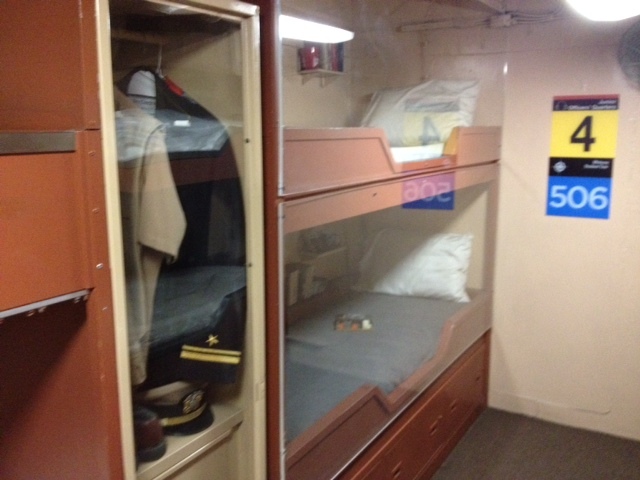 The lowest bunk looks barely big enough to host a guitar case much less a person, but that’s how many sailors slept aboard the Midway. In this sailing city, there’s a lot of space devoted to sleeping and eating, and when you’re not in a bedroom, you’re likely in a kitchen or dining room for much of the first legs of the tour, although one of the early stops is the area where they stowed the anchors. On the audio tour, which is excellent, a seaman shares a story about the ship’s “anchor pool” that tells how when the anchor would drop, the entire crew would look at their watches. What minute and second the anchor dropped mattered in that crew members each had a time reserved in a pool and the corresponding times resulted in more funds for shore leave for the winners. You quickly get a sense of how crew members passed the time – lots of it – at sea when they weren’t participating in the ship’s day-to-day operations. And the days had to have been long. For one thing, on the tour, save for a glimpse through a porthole here and there, you rarely see the sun or the ocean. Just think how disorienting that alone must’ve been. And if you worked in, say, the engine room, the laundry room or another steamy area in the inner bowls of the ship, well, it probably felt a lot like another hellaciously warm place. 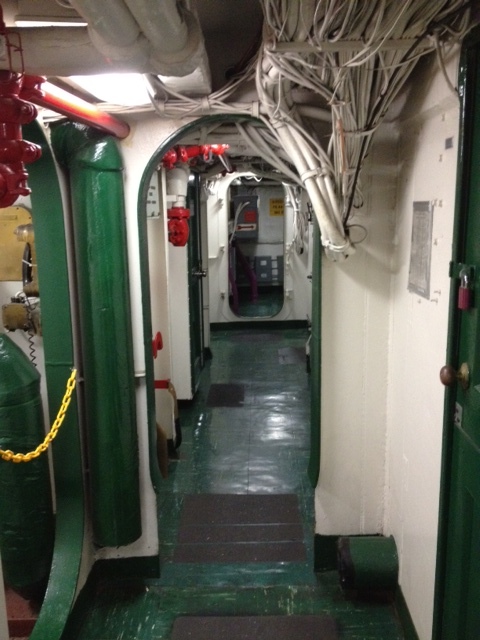 We’ll just say that after 15 or 20 minutes below deck on the tour, it’s a relief when you “surface.” Now imagine spending entire days, weeks and months like that. Beyond the handling and transport of tons of military ordinance and the perilous landing of planes on the ship’s flight deck, the very storing of elements critical to the ship’s operation presented a danger and, in fact, nearly inflicted a mortal wound on the Midway. While at sea near Japan in 1990, a compressed oxygen explosion killed three crew members and injured eight others. The oxygen plant on the tour was on the same level as the cargo hold, where old photos shot you tons of stored ordinance as well as dozens of aircraft. It seems like a small detail when the audio tour diverts your attention to the barely noticeable red-and-yellow fire doors that would close off half the hold in case of fire, but then you realize, no detail was too small on the Midway. Once you reach the cargo hold, or hanger, you finally get close to some of the military planes and helicopters you see before you board the ship. The aircraft on display are from a cross section of aviation history and are marvels unto themselves. 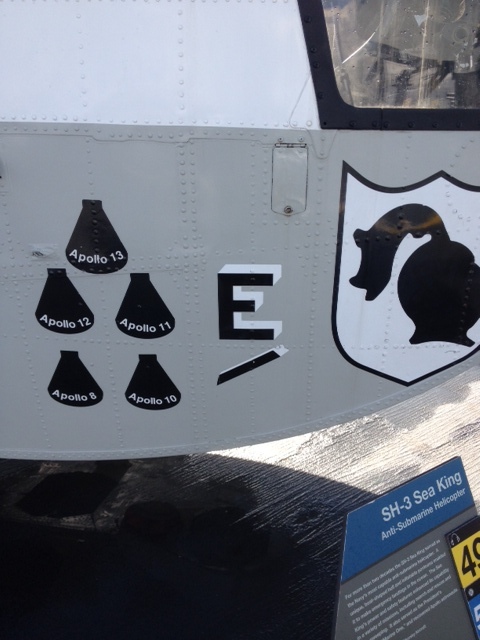 On the flight deck, among other aircraft, you’ll discover the helicopter that retrieved astronauts from the Apollo missions, including the ill-fated Apollo 13, and it makes you start to appreciate all capacities in which the Midway served its country besides war. But this was a battleship after all and war was why it existed. Which brings us to the Persian Gulf. 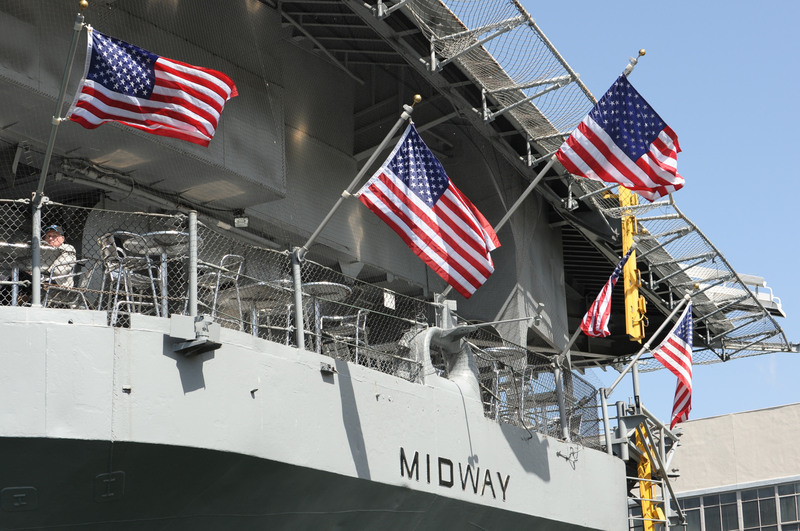 The Midway had previously served in operations in Vietnam, but the Iraq war where the Midway was the flagship for American’s air operations at sea and the pinnacle of the ship’s service. And what a show it must’ve been. Another audio file calls a fully functioning flight deck “the greatest show on earth” and I don’t doubt it, given the coordination of crew and craft. The volunteer we met in the room where combat operations were coordinated informed us that 25 men ran the show from inside a box no bigger than your living room throughout the Gulf War. It’s always humbling to walk in the footsteps of history, but it’s even more so to meet someone who was there, as this man was. Now retired for six years, he says he returns to the Midway monthly, driving from Nevada to volunteer for a week at a time. And that’s the type of commitment and dedication that really brings the Midway to life and that I had not nearly enough time for on Friday. In just brief conversations or overhead bits of presentations, the passion and admiration with which these volunteers share their insights and stories is truly inspiring. They’re the true legacy of the Midway and they make an incredible contribution by giving of their time this way. Next time, I’m going to allow more time to let them share all they have to offer and, in turn, more fully appreciate what this ship meant to them and our country. For now, I’m just happy to have had the experience and be better able to share the Midway’s story with others and be better able to properly guide guests on the next tour. This ship has hardly sailed as far as me touring the Midway again. Consider me locked and loaded, and (tail)hooked on learning more. 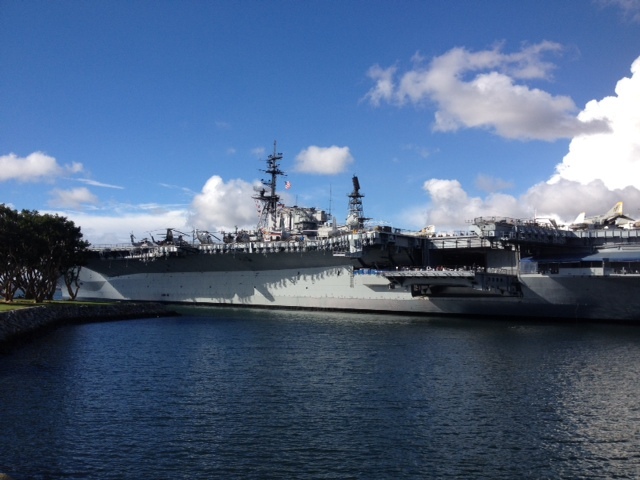 This entry was tagged battleship, Gulf War, harbor, Midway, military, Persian Gulf, San Diego. Bookmark the permalink.